The artifacts depicted are all from the Asian American Comparative Collection except where noted. Thanks to Jenny Ralston for taking the digital photographs, except where indicated, and to Terry Abraham for incorporating them into this Web page. Scales vary. For more information, including artifact names as used by the Asian American Comparative Collection, you may order "Chinese Artifact Illustrations, Terminology, and Selected Bibliography." 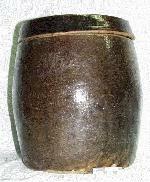 Green glazed wares; top, barrel jar. Photo by P. Wegars. Oil can lid, interior; circular hole is sealed with square patch on exterior. 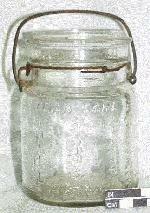 Dimensions, 23.5 cm. 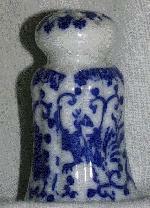 x 15.5 cm. Note characters to right of hole. Photo by Chantelle DeLay. "Double Happiness" pattern rice bowl fragments. Photo by P. Wegars. "Attributes of the Eight Immortals" sauce server, two lids, rice bowl, spoon, three teacups, liquor cup. Photo by P. Wegars. In recent years, the incorrect term "damper" has often been used for these objects. 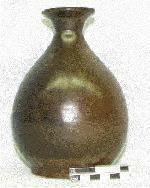 An opium pipe bowl is NOT a "damper." See top of page for drawing of opium pipe stem (bamboo), with opium pipe bowl, opium pipe bowl connector, and opium pipe saddle. 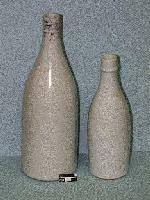 Bottle on left is often mistakenly called an "opium bottle"
Scales vary. For more information on these and other objects, including artifact names as used by the Asian American Comparative Collection, you may order "Japanese Artifact Illustrations, Terminology, and Selected Bibliography." "Celadon" (greenware) with handpainting . Photo by P. Wegars. 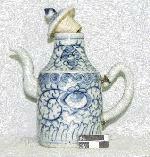 Vessel for heating and serving sake (tokkuri); teapot. Photo by P. Wegars.